Amongst the hundreds of academic books that reach the Newsam Library every month, a colourful cover caught my eye, with two people crossing an orange desert under a deep-blue sky lit by a dazzling moon. This painting is in fact taken from the children’s book The colour of home, the story of a child from war-torn Somalia who finds refuge in Britain but is haunted by horrendous images. 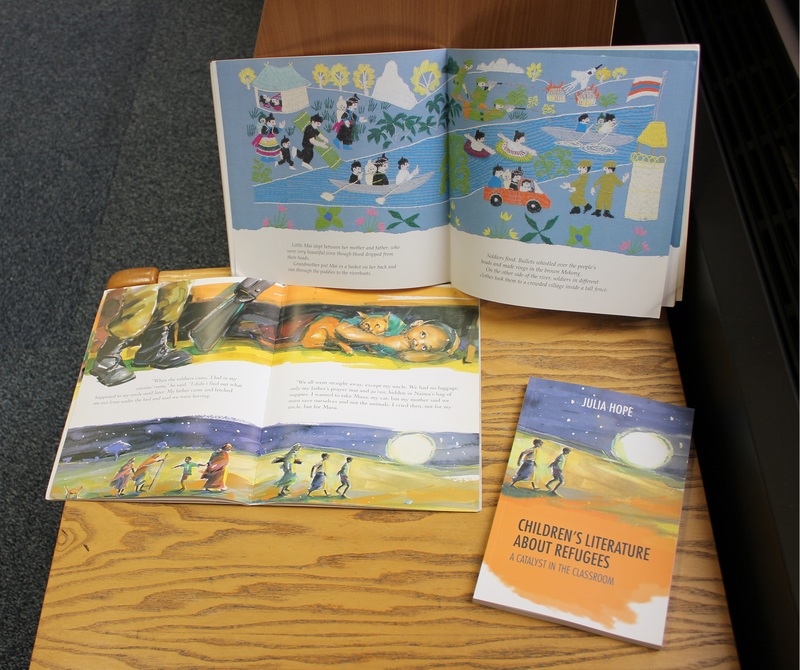 For her PhD thesis, Julia Hope interviewed the author, Mary Hoffman, and the artist, Karin Littlewood, and has now published Children’s literature about refugees at Trentham Books, an imprint of the IOE Press. At the UCL Institute of Education, we have this picture book in several copies. The same is true for another work that Dr Hope discusses with its author: The other side of truth by Beverley Naidoo tells the story of two Nigerian children in England. Our Curriculum Resources Librarian, Sally Perry, strongly recommends this novel for teenagers as well as adults. We have some more rather grim young adult fiction about refugees: about child soldiers. You can look up this term or others together with ‘Juvenile fiction’; at the IOE, we index our novels so that you can identify the subject and use them for teaching. The whispering cloth is set in a camp for displaced people in Thailand; illustrator Anita Riggio and embroiderer You Yang visualise dreams of a new home (see photo above). My name is Sangoel takes a Sudanese boy by ‘sky boat’ to the United States, where he is determined to keep his ‘strange’ ancestral name. One of the books reaching out to the youngest children is My name is not refugee. Kate Milner offers very simple texts and direct questions: “What would you take?” or “How far could you walk?”. A haunting Mongolian folktale has been skillfully integrated into an equally moving tale of boat people. A story like the wind by Gill Lewis has been beautifully illustrated by Jo Weaver, all in the same melancholy shade of teal. As regards non-fiction, Wayland recently brought out the series Children in our world, with titles like Refugees and migrants or Poverty and hunger. World issues are explained in simple terms and images, the dire problems always balanced with proposals for relief and change – starting with the children themselves. 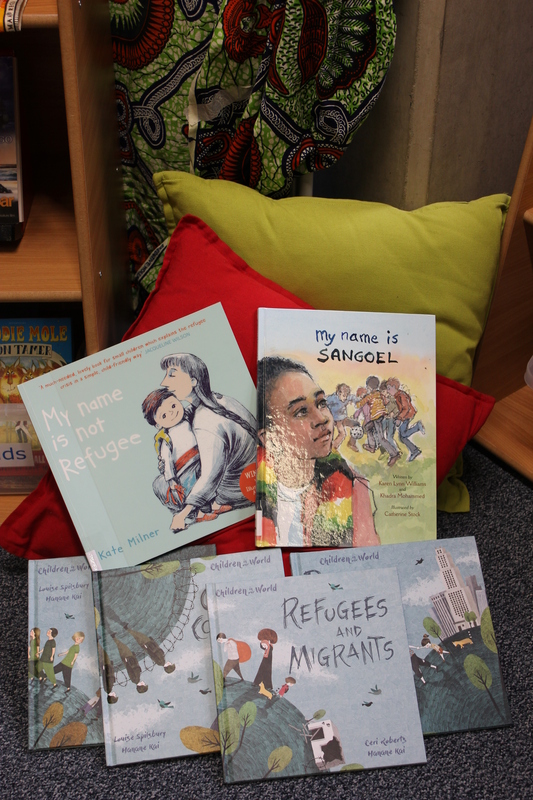 Independence publishers in Cambridge update their compilations of topical texts for secondary school pupils all the time; we hold three different Issues editions on the topic of Refugees. Children’s literature about refugees also describes ways in which those books are used in primary schools. The lovely stories themselves, though, suggest very imaginative activities; it seems that parents and teachers can learn a lot from poets and artists! The little boy in The colour of home renders a cheerful memory of his home in Africa – only to paint it over with garish flames and murky smoke. Perhaps pupils could follow this example and paint over one half of peaceful pictures… or one half of violent pictures? Sangoel, in turn, puts his own name onto his T-shirt, converted into images so that his peers can pronounce it as ‘sun’ + ‘goal’ – all the more useful since he plays football! His classmates are thrilled by the idea and try to find rebuses for their own names. The little girl in The whispering cloth transforms her wishes into a narrative embroidery; could this not be done, too? Could not both girls and boys fashion textiles which express their experiences of their own home, of a lost home, of a hoped-for home? Whatever you want to teach, you are likely to find related activities and lesson plans at the Newsam Library, some in the Main Education Collection and some in the Curriculum Resources collection, and many more of course online. You could always try the search terms ‘activit*’ and ‘lesson plan*’ together with your topic or your curriculum subject. Another special form of books are those without any words at all. 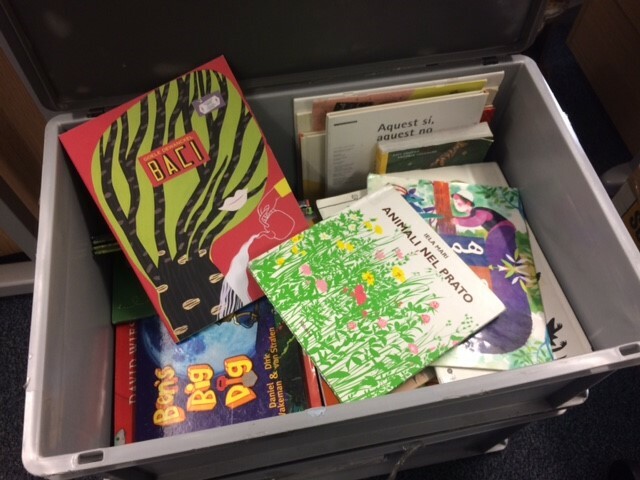 Sally Perry’s essay about the exhibition Silent Books : Final Destination Lampedusa at the IOE in 2017 gives you an insight how IBBY provides books for refugee children. As a teacher, you are likely to have pupils from many backgrounds, some with little English; ‘silent books’ could be a way of bringing everyone together. The touring exhibition had to move on, but we have wordless books on our shelves – for everyone from very young children to adults! – and you can find them at ‘stories without words’ on our catalogue. Not a happy subject, but I wish you happy reading… and looking at pictures… and drawing and painting! 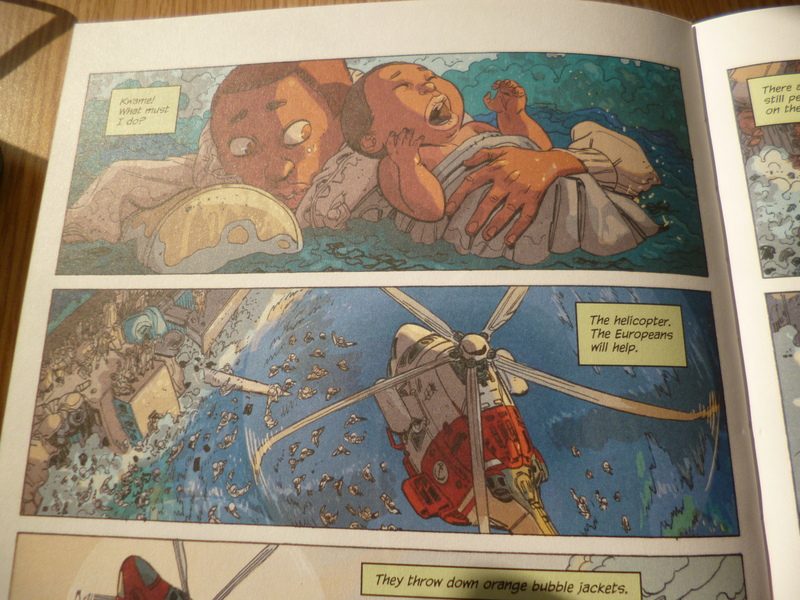 Please also note my previous blogpost on graphic novels and illustrated teaching materials about migration and refugee issues. This entry was posted in Curriculum Resources, Main Education Collection and tagged art in education, children's literature, citizenship education, picture books, refugee education, refugees, social issues, stories without words. Bookmark the permalink.